(SEHK 00700), Mail.ru (LSE: MAIL), MakeMyTrip Limited (NASDAQ:MMYT) and Flipkart. Naspers is listed on the Johannesburg Stock Exchange (NPN.SJ) and has an ADR listing on the London Stock Exchange (LSE: NPSN). Today, the Naspers group is organised into six business areas: Classifieds, Payments, B2C eCommerce, Ventures, Video Entertainment, and Media. We also hold sizable investments in listed assets Tencent, Mail.ru and MakeMyTrip Limited. Our Classifieds business provides mobile and digital local marketplaces that connect more than 300 million buyers and sellers every month in more than 40 countries around the world. Our companies OLX, Avito and letgo have the #1 mobile classifieds app in more than 20 countries. PayU is one of the largest Payment Service Platforms in the world, focusing on markets with long-term growth potential. It has leading positions across Africa and the Middle East, Central and Eastern Europe, India, and Latin America. PayU’s 250 payment options enable safe transactions in 16 countries for more than 160,000 merchants, allowing them to focus on reaching the 2.2 billion consumers in our markets. Our B2C eCommerce segment contains our business to consumer e-commerce companies and investments. These businesses are leading players in Latin America, Central and Eastern Europe, the Middle East and Africa and include eMAG, Flipkart, Konga and Takealot, as well as our investment in the leading online travel business in India, MakeMyTrip Limited. 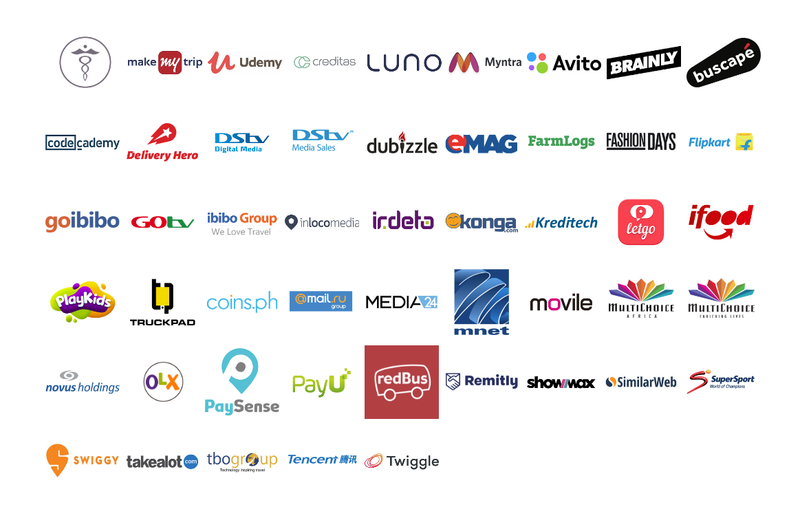 Below an image showing some of Naspers's main brands and investments. South Africans are sure to recognize a number of the brands in the image below. ​The graphic below shows the contribution to Naspers (NPN) revenue for the 6 months per income stream (note this is revenue before equity accounted part is subtracted so the total amount shown in the pie chart is far greater than the $3billion reported above. But it does show readers where revenue is earned for the group. From the pie chart above it is clear that majority of revenue for Naspers comes from Internet services, which contributed 69.34% to NPN's revenue, second biggest revenue earner was E-commerce with 15.2% or $1.987 billion dollars followed by video entertainment, with 14.1% or $1.834 billion. The results which NPN would be the first to admit is largely driven by what happens with Tencent, The rest of their operations are so small that it even if it showed tremendous growth it would hardly impact the results as the majority of Naspers's earnings comes from their equity accounted investments driven by Tencent. Without their equity accounted investments NPN would have earned a mere $49million in profits during the period instead of the total profit reported of just over $3.4billion. This shows the massive contribution their equity accounted investments in Tencent makes to their earnings.